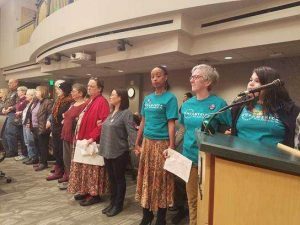 After months of community organizing and advocacy, King County, Washington Council adopted a new Immigration Ordinance that protects the privacy and civil liberties for immigrant and refugee communities. The Ordinance serves as a national model for counties to ensure that their limited resources are not being used to collaborate with an aggressive deportation agenda. 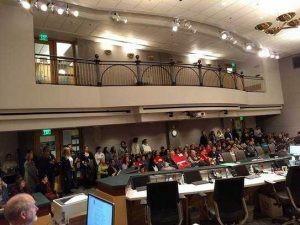 King County has been on the cutting edge of fair and equitable immigration legislation for the past decade. In 2009, the County adopted legislation to ensure residents, regardless of immigration status, felt safe coming to police to report crimes. This new ordinance is no exception to that trend and further outlines explicit policies to protect the health and safety of immigrants and refugee communities. In response to aggressive federal policies that seek to disenfranchise and marginalize immigrant and refugee residents, King County took action. Community coalitions in conjunction with legal organizations partnered with the local government officials to address real harms experienced by residents. The Immigration ordinance is a testament to the efficacy of collective power to build powerful advocacy campaigns. Member Larry Gossett, was the lead sponsor of the ordinance, with Co-sponsors, Joe McDermott, Jeanne Kohl-Welles, and Rod Dembowski. The Immigration Ordinance was introduced to the Law and Justice Committee in November of 2017, discussed in January, and finally passed on February 26, 2018. The United States is a country of immigrants and only a small percentage of current residents of the landmass are directly known descendants of those living here 500 years ago. Nevertheless, there is a deep history of racism directly intertwined with immigration law, policy, and economic need. At various moments, which groups have been allowed to claim the privileges of “whiteness” has fluctuated. This designation is often linked to when certain groups of people arrive to the U.S. and in what numbers. The recent wave of immigration is receiving considerable public attention and is a source of great controversy. The fights over immigration reform are being contested in real time: what does it mean for immigration to be “legal” or “illegal” immigration, which children raised in the U.S. can stay, and which tax paying families can claim benefits of education, health care, and social security. With the Trump Administration’s Muslim ban, vehement advocacy of a boarder wall, and increased number of Immigration and Customs Enforcement (ICE) officers making arrests, issues of immigration are center-stage in our communities. These policies induce a “chilling effect” on immigrant communities who fear arrest, detention, and deportation – no longer able to seek the health care and protection to which they are entitled. In January of 2017, two groups were formed to bring advocates together to talk about immigration issues. 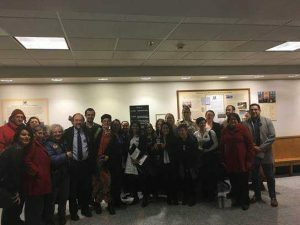 The Justice Advocacy Network focused on the policies and rights of immigrants while the Washington Immigrant Solidarity Network built collective power by focusing on organizing, education awareness, and advocacy on issues as they arose. Both of these groups met continuously to discuss problems of ICE and the role of government collaboration with ICE. If the government is an institution of the people and for, how could King County prepare to fight against the new federal policies and continue to protect the rights of the most vulnerable residents of our communities? This ordinance will prevent the use of County funds and resources on federal immigration enforcement. Additionally, it outlines positive steps toward protecting and supporting the wellbeing of immigrants and refugees who seek services from the county. The ordinance puts into effect an actionable plan to make King County a more safe and equitable place to live for all community members, regardless of their nationality or immigration status. King County employees, including law enforcement officers, are prohibited from asking about immigration status or investigating whether an individual has violated civil immigration laws. The County will not deny anyone public benefits or services based on immigration status, unless requited by law. The County will prevent federal immigration agents from having access to non-public areas of county facilities or give them access to databases without a judicial warrant. Jail staff will explain to all people in jail who face the possibility of ICE interviews their right to remain silent as well as their ability to decline an interview. This ordinance is one of the most progressive pieces of legislation providing protection to immigrants and refugees; thus it will likely be adopted as a model for other governments. Even smaller cities, that might not have the capacity to establish an Immigration and Refugee Commission, can draw from the best practices identified by King County. In addition to the substantive changes in the county, this ordinance serves as a symbolic statement reaffirming King Count’s commitment to protecting and promoting the advancement of immigrant and refugee communities. Not only are the policies exemplary, but the process for passing the legislation can serve as a model as well. This is an example of passionate community organizing and a government who listened to the people in the community. King County Council partnered with local legal institutions and community advocacy groups to create laws that benefit the communities they seek to serve. The method of passing this immigration ordinance displays a replicable model of good governance. Unlike police, ICE agents are not legally required to inform individuals of their Miranda Rights. For a full PDF version of the ordinance, click here.